Jennifer Calderone (pictured here with her handsome helpmate Rex...guess that makes him King Bling..get it...Rex...King?) 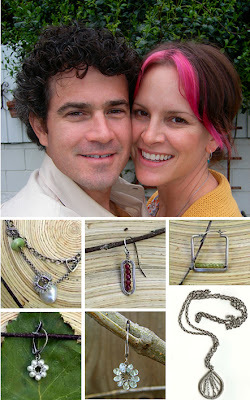 will have her latest jewelry on display and for sale at this years Bazaar. Her jewelry is exceptional and a sell-out every time, so be sure to show up early if you want to make sure you get a little su-um-su-um that's just right for you or dear ol' mum.